David Arnott explains the ins and outs of thermal mass and how it affects building materials. The term passive design is one that many people would have heard. Fundamental to passive design is using certain intrinsic principles, of place and materials, to design and construct comfortable environments with minimal or no additional means of artificially controlling the temperature; the obvious example of this would be air conditioning. Thermal mass is one such element of passive design. Thermal mass is a term used to describe the ability of certain materials to absorb and store heat. In this sense, thermal mass has been likened to a thermal battery. The stored heat is then re-released at a slow and constant rate and this cycle is referred to as thermal lag. The accompanying diagram neatly illustrates the thermal lag of materials with thermal mass, and when compared to lightweight materials we can see the delayed influence of the outdoor temperature on the more massive materials. Thermal mass is generally associated with materials that have a high density and are relatively good conductors, such as concrete, masonry and stone. If you want to think a little outside the square, you may be interested to know water performs twice as well as any of the aforementioned. Lastly, it is important to understand a significant amount of energy is required to change the temperature of these materials. So they will remain at a fairly consistent temperature without a sustained effort, or in other words, a prolonged change in temperature. Thermal mass doesn’t take sides. It is neither good nor bad, it’s neutral. Moreover, it is reliable. It will always behave the same way in the same situation. Consequently, understanding the intrinsic abilities of thermal mass is essential to using it effectively. The ability to absorb and store heat before re-releasing it at a slow and constant rate. A considerable amount of energy is required to change the temperature of these materials. In the context of passive design the energy source is the sun, and for the sake of this example we will keep things simple. We want to attempt to take advantage of the sun’s energy (heat) in winter and protect ourselves from it in summer. In winter, by exposing thermal mass to direct solar gains we can charge the battery so to speak. The mass will then start to slowly re-release this heat back into the space; most of which will occur after the sun has fallen and temperatures start to drop due to thermal lag. Conversely, in summer we can expose the mass to cooling night time breezes. This accelerates the re-release of any excess heat that has been stored in the mass from the previous day and primes the material for the next day. By restricting exposure to prolonged high temperatures (direct sunlight or ambient temperatures) the mass will help to regulate the indoor temperature and leave it less vulnerable to isolated spikes. Thermal mass does not discriminate however, and will behave in exactly the same way regardless of the season. Using an example from above, if it is subjected to direct solar gains in summer it will absorb this energy and re-release it over an extended period in the same way that it does in winter. Only this time, it is not part of a passive solution but a contributing factor to an uncomfortable space. Furthermore, once that energy is stored it must be re-released and the inherent thermal lag makes for potential prolonged discomfort. Of course you can speed things up with air-conditioning, but this will use considerable energy, which means extra dollars. Prevention is also better than a cure. It is important to understand the type of climate your proposal is situated in, in order to use thermal mass successfully. In selected climates it is best practice to not use thermal mass at all, and in others the location and extent of thermal mass varies greatly. 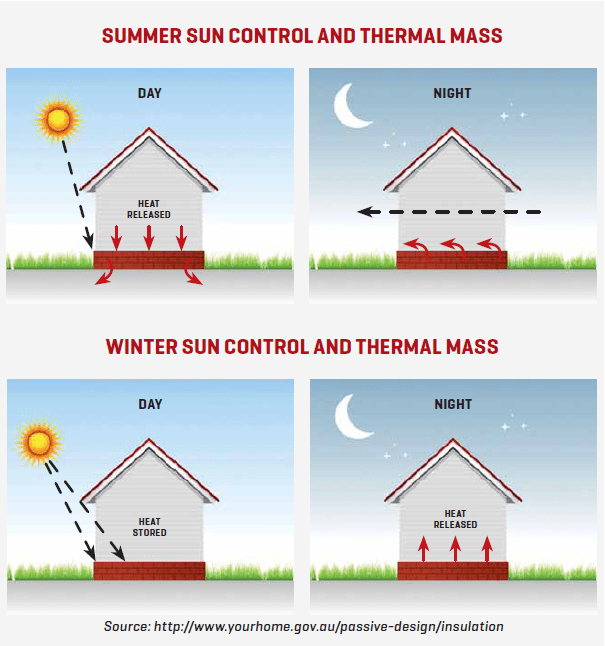 Thermal mass is most effective in climates with a large variation between day and night temperatures, otherwise known as the diurnal temperature range. In these locations the large diurnal range can be harnessed in combination with thermal lag, as described above, for significant improvements in comfort. A large diurnal temperature range is not essential to the successful use of thermal mass; however sound knowledge of the climatic conditions where the mass will be located is critical. Couple this with a good comprehension of the two main properties of thermal mass and you can start to make some informed decisions about whether you should utilise thermal mass or not, and if so, to what extent. The “Design for climate” section of the Your Home guide is a great resource to help in this endeavour. It has a range of great suggestions for good passive design, including thermal mass, relevant to the eight climate zones from the National Construction Code (NCC). There are 69 NatHERS climate zones that inform residential ratings with somewhat more specific climatic data. But whether you are looking at eight or 69 climate zones is to a degree irrelevant, the theory will remain the same. To achieve best results, mass does not work in isolation, rather it is one player in a team of strategies that all work together to achieve a common goal, that is thermal comfort. Orientation, insulation and occupant behaviour are all key contributors. Orientation is important because by knowing the latitude and the position of true north we can accurately track the sun’s path throughout the year. Using this knowledge we can design to control when and how much direct solar gains are allowed to enter a particular space. The ability to have such control means we are able to take full advantage of any thermal mass. This is most succinctly demonstrated by a dwelling that is facing true north (note: when given the choice this is the ideal orientation). Because there is a significant difference in altitude between the summer and winter sun, where the summer sun sits much higher in the sky, we are able to exclude direct solar gains in summer yet allow good solar penetration in winter by simply providing an appropriate size eave. When this is combined with a polished concrete floor we have perhaps the plainest example of valuable use of thermal mass in passive design. While we are not always fortunate enough to choose our ideal orientation, insulation is something we can have control over. Firstly, it is important to understand thermal mass is completely different to insulation. Materials with good thermal mass do not insulate particularly well when compared to typical forms of insulation. For example, 150mm of concrete has an R-Value of R0.1, whereas a typical 75mm glasswool batt product has an R-Value of R1.5. The NCC does recognise the importance of thermal mass in building performance and gives a concession of R0.5 to the required total system R Value of external walls, however it does not negate the need for insulation completely because the impact of this would be substantial. Insulation is best used in conjunction with thermal mass when placed between the outside conditions and the material. By supplying this barrier we limit the influence of the outdoor temperature on the thermal mass, thus allowing it to maintain a stable temperature and help to regulate indoor conditions. This can be equally true when it comes to a concrete slab on ground construction. Providing a barrier between the ground and the concrete slab can be beneficial, but to a lesser extent, and is more dependent on the climate. To demonstrate the impact the location of insulation has, let’s look at typical brick veneer construction versus reverse brick veneer. In this first instance we have outside air, brickwork (thermal mass), insulation and finally indoor air. With this configuration the brickwork does very little to contribute to the overall performance and in fact in certain instances might actually make matters worse because on hot summer days, after sustained exposure to the sun, it may re-radiate this heat back into the building long after the sun has set. The insulation will do its job of restricting any heat flow, but it does not aid the thermal mass in any way. Now when we flip these two elements, it is a different story. Again the insulation will do its job, but now it is restricting this flow of heat before the heat hits the thermal mass, meaning the influence of the outside conditions is dramatically reduced. By making this simple switch, a dwelling in a temperate climate will typically improve by half a star without making any other changes. Before we move away from insulation we should quickly touch on where not to locate insulation. In this context the term insulation is used in a very rough sense of the word. We are not necessarily speaking about specific insulating products such as batts or reflective foils, instead we mean any material that will resist the flow of heat, no matter how little that resistance is. The two best examples of this would be carpet and plasterboard. Covering a concrete slab with carpet severely reduces the role that thermal mass can play. By covering the material it stops any meaningful heat gains and therefore the slab cannot be charged to re-radiate that heat at a later stage. Covering an otherwise exposed internal wall surface such as brick or concrete has the same effect. Occupant behaviour is the last player we will explore. In order to get the most out of a passive home or commercial space the occupants need to be active participants. This is especially true when it comes to thermal mass. If the occupant does not open windows to allow in cooling breezes when required or keep windows closed on especially hot days, then the materials will not perform at optimum levels. Remember thermal mass will always behave in the same way and can just as easily work against you if not treated appropriately, so the occupant must be educated and engaged. There are certain instances where building out of anything other than lightweight construction is not an option and as a result, any opportunity to introduce thermal mass is lost; until recently. With the introduction of phase change materials (PCM) to the market there is now a viable lightweight substitute for thermal mass. As the name suggests, these products work by using specific materials that respond to increasing or decreasing temperatures by changing their phase (i.e. from solid to liquid or liquid to solid). By doing so they can behave in much the same way as thermal mass. As the temperature increases the heat is absorbed into the PCM which causes it to melt and store this heat energy. When the temperature starts to decrease again this heat is then re-released and the PCM starts to change back to a solid. Although these products can be expensive when compare to typical high mass materials, they can offer a great alternative when the situation calls for it. They are also a great way to introduce thermal mass into an existing space. Waterproofing and screeds – above or below?